With summer in full swing and the sun shining almost daily, it’s the perfect time to spend some time outdoors and enjoy the deliciousness that is local Ontario foods. We are incredibly lucky to live in an area that is ripe with farms and markets, from pick your own to farmers’ and on-farm sales, we have it all! At my home we are lucky to have a garden that produces a modest amount of vegetables and herbs for our own use and as anyone can tell you, fresh produce has a taste that cannot be matched. My girls love to pick and eat tomatoes and peppers straight from the vine and I love that they are gaining an appreciation for eating “farm to table”. Burlington and Halton are home to many farmers’ markets and visiting one can be as simple as popping by and picking up what you need or if you have the time and inclination you can make it an experience. For those with children it’s a great opportunity to talk about farming, where our food comes from and for the really wee ones it’s a great place to explore colours, shapes and sizes – see learning can be fun. Wednesday, Friday and Saturday until the end of October, Burlington Mall plays host to the Burlington Lions Club farmers’ market. As a frequent visitor to this market, I can tell you that the vendors are more than happy to spend time chatting with you about their products and most are actual farmers bringing their goods to you. This market has a wide variety of goods including produce, meats, cheeses and some specialty vendors offering baked goods, ice cream and more which makes it a one-stop market plus they send out a newsletter weekly in-season to let you know what is available and links to recipes in case you need some inspiration. For those that live, work or play in Downtown Burlington, you will be happy to know that Centro Garden on Brant Street has added a small farmers’ market in their back lot on Fridays (running until the fall). This market focuses on primarily organic product with Plan B Organics, Featherstone Farmers and Farm to Table Meats as the main suppliers. Other vendors and special guests pop in so be sure to visit their website to find out what’s happening week to week. While you’re there give yourself a few extra minutes to chat with the gang from Plan B Organics, they are very passionate about what they grow and can give you great ideas on how to use that produce you just purchased. I know this for a fact since I purchased some kale (after hearing so much about the benefits of it) but had no idea how to cook it and make it taste delicious – thanks to Rod my sautéed kale was a hit at dinner that night. If you are looking for an on farm experience, Halton is home to many pick your own farms that give you a chance to harvest your own fruits and vegetables. Every year I take my girls apple picking, they run down the rows of apple trees looking for the perfect low lying branches to fill their bags. The temptation of the juicy red fruit is usually overwhelming and a couple of apples are consumed en route. It’s such a fun day out for everyone and the added bonus is we come home with bags of freshly picked fruit to enjoy. This year the weather has not been kind to our apple farmers but we are hoping their crops make it. Speaking of apples, be sure to visit Ireland House at Oakridge Farm Museum on September 30 for their annual Applefest Fall Fair. For those that prefer to buy direct from the farmer, many also offer on-farm markets and some such as Springridge Farm, Andrews Scenic Acres, Chudleighs, Stone Haven Farms and others have activities and events for kids and families to enjoy. For a complete list of farms offering farm fresh produce visit the Halton website. One of the newer things happening here in Burlington is the community garden. 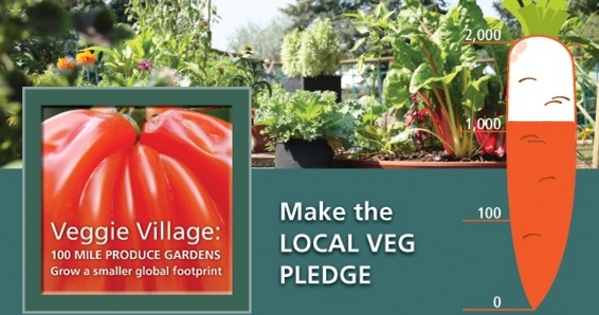 This initiative from Burlington Green gives local residents that don’t have green space the chance to have their own garden. For a small fee residents purchase one or more of the thirty available plots in the garden and then tend to and harvest their produce. This garden also helps the local community with two donations already this year to Food for Life and a third expected before year-end. The garden at Central Park is open to the public to tour as long as the gates are open. Burlington Green is hosting a speakers series focused on helping you eat local, check out the schedule here. Looking for a more interactive garden experience? Head to Royal Botanical Gardens and explore Veggie Village where you can tune into an audio tour using your cell phone. 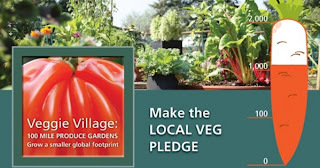 Learn all about edible plants and what you can do to eat local year-round then take the “Veg Pledge” and be committed to eating locally. The produce that is harvested from this garden is used in the restaurants at the RBG plus they offer the Edible Weekends series with cooking demonstrations, educational programming and special menu items. The final weekend for this series is August 25-26 (featuring garlic)! If you live in Halton Region and have fruit bearing trees that you don’t harvest, consider contacting the Growing & Sharing program which benefits everyone. The way it works is, throughout the growing season, small groups of volunteer pickers will go to your property and harvest the fruit. The harvest will be shared 3 ways: 1/3 to the property owner, 1/3 to local food bank, and 1/3 to the pickers. It’s a great way to avoid a yard full of rotten fruit plus you help the community and have fresh fruit to eat. If all this talk of food is making you hungry and you don’t want to cook, don’t despair, several restaurants in Burlington are committed to the use of local foods and you can regularly find fresh Ontario produce, meats and cheeses on their menus. Be sure to visit Red Canoe Bistro, Spencer’s at the Waterfront and Water St. Cooker to see what their chefs have cooked up. No matter how you slice it (or dice it or cook it), eating local is a great way to support our farmers, eat nutritious, sustainable food and reduce your carbon footprint. It can be fun and easy and no matter whether you do a little or a lot, it all makes a difference. Come discover the foods and farms of our Region and taste the difference.